Open to babies through preschool. Sponsored by the Friends of Petersburg's Libraries! At each 100 book milestone, visit the library during Toddler Time or Open Play for a sticker & photo. You log each book you read to your child. If you read the same book 10 times, just log the book ten times. Can I count books that are read to my child in school, or by a nanny or day care provider? Yes, any book that is read to your child by anybody counts. Do the books have to be library books? No, any book you read counts, whether it's a library book, your own book, your friend's book, etc. What if a child can read before starting kindergarten? Does it count when children read books by themselves? Reading is an important activity for adults to do with children, so if your child reads to you, that counts too! My child likes to listen to books on the computer/iPad/eReader/etc. Can I count them? As long as your child listens to the whole book, it counts! What happens when my child starts kindergarten? Do we have to stop? You can keep participating in the program until December of the year your child starts kindergarten. 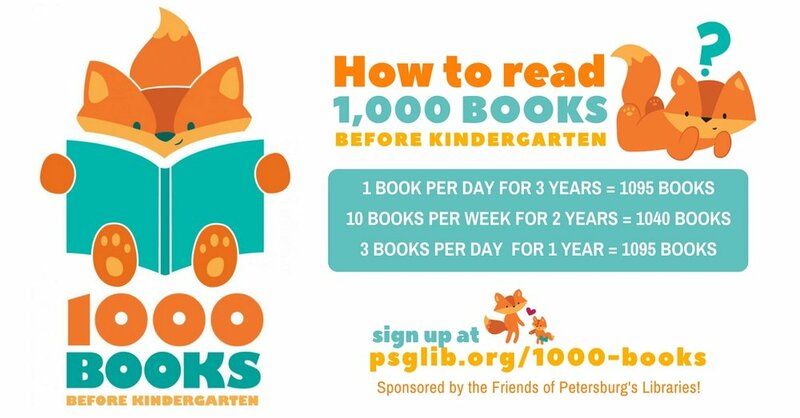 Thank you for taking part in 1,000 books before kindergarten! To get started follow the steps on the left. Questions? Contact Jessica at the library!